While bringing the outdoors inside is nothing new when it comes to interior design, the ways to do it are endless and sometimes surprising. 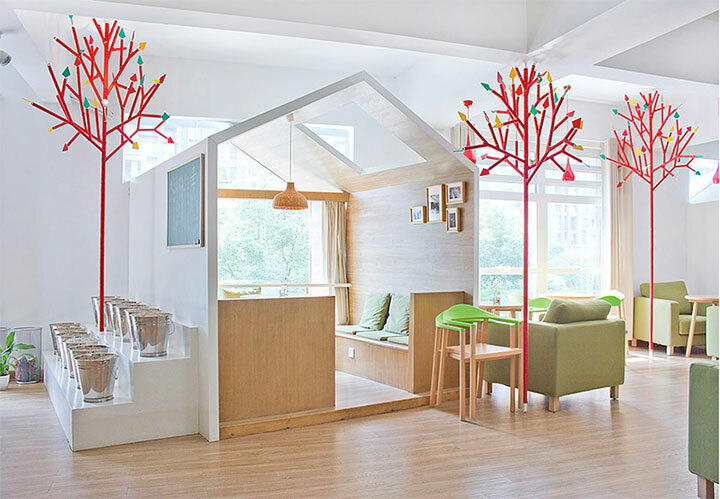 The charming Kale Cafe in Hangzhou, China, dreamed up by the Shanghai-based YAMO Design Studio, uses made-up trees and ingenious space dividers to create a fun and unique interior scenery. 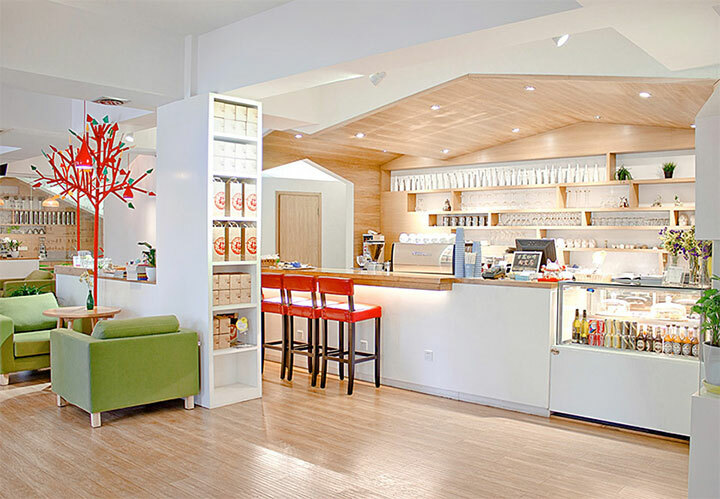 Even though the idea sprang from trying to solve a functional problem, the result is an excellent example of a theme coffee shop design that works. Having to work with a low ceiling that was not accommodating to extensive lighting, the designers came up with the brilliant idea of supplementing the system with tree lights. Placing these trees at well calculated intervals, they managed to solve the problem while producing the decorative elements that define the space. 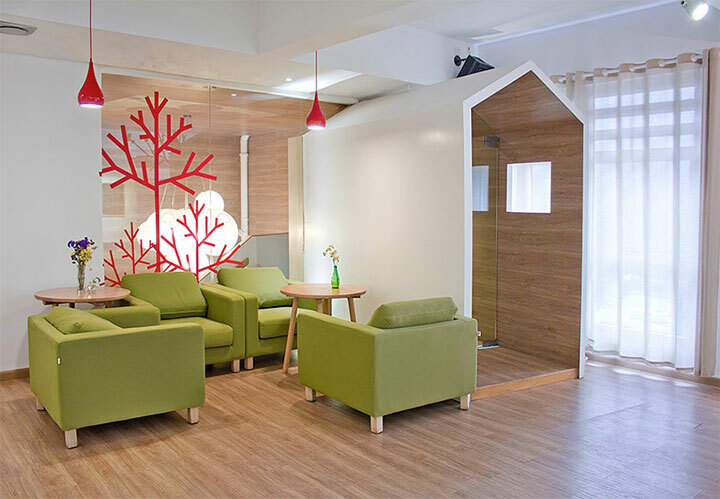 Among these stylized trees, the booths take the space divider concept to another level. Instead of a simple semi-wall for privacy, the designers took the idea and ran with it, building each booth into a mini house. 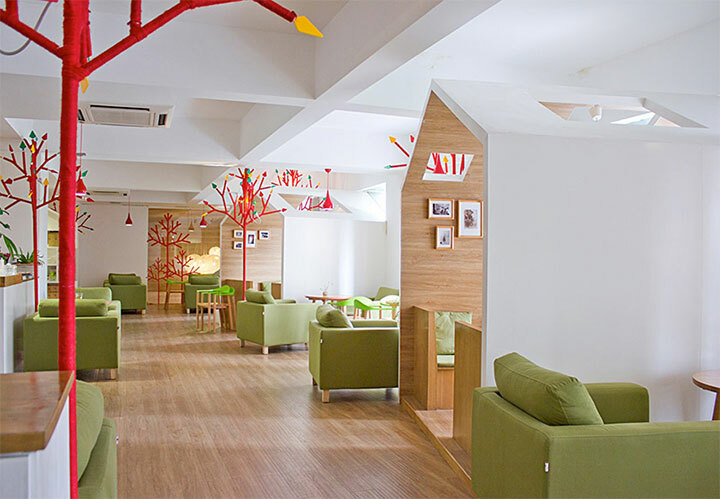 With full walls on both sides, a roof-shaped ceiling, and completed with wall art to emphasize the familiar feeling, each house-booth turns into an inviting little nest. The house motif is reiterated and reinvented in every corner of the coffee shop, from the shape of the ceiling above the bar to that of the walkway that leads to the restroom area, and from the entrance area to the façade of the coffee shop. To emphasize the idea of an outdoor space, the green upholstered armchairs bring in just the right touch. In addition, wood tables in neutral shades and light-toned wood floors evoke the textures and hues of nature. 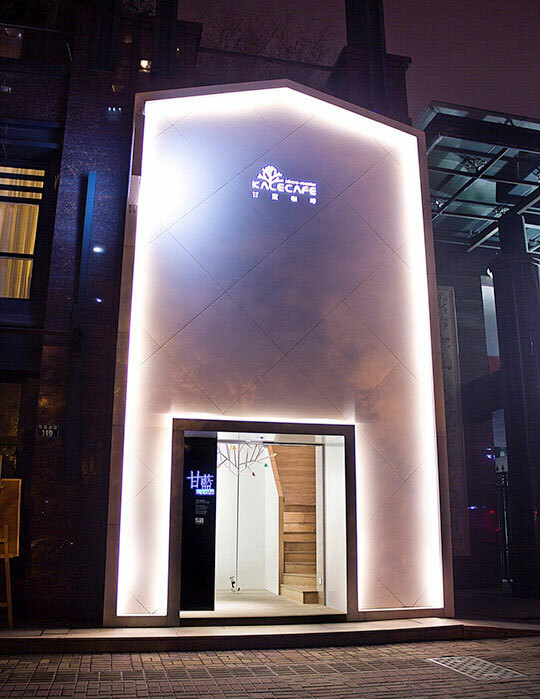 Using light tones, the designers ensured that the interior takes full advantage of the available lighting. House booths and trees add up to the charming image of a little village that customers like to take all in when walking to their spot, sitting at the bar, eating, or enjoying some of the informal sitting areas sprinkled around the coffee shop. In keeping with their attempt to create a bright, luminous space, designers used only neutral tones on a mainly white background, on which the dark red of the trees pop up. 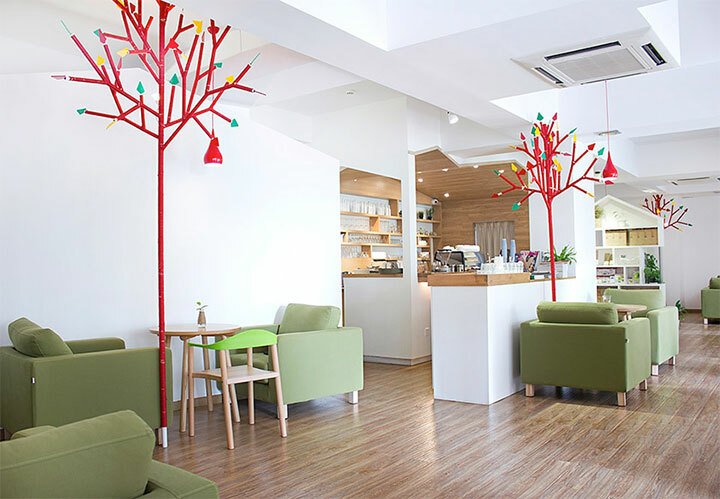 This is a perfect example of a theme coffee shop design that, while being different and daring, manages to remain tasteful and elegant.